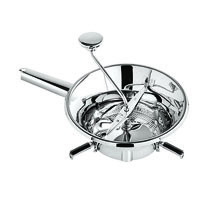 2 quart food mill is used to strain or puree fruits and vegetables. By placing cooked fruits or vegetables in the mill and turning the crank, the semi-circular blade oversweeps, compresses and scrapes food. The bar that straddles the container applies constant preassure against the cutting plate and crushes the food, while retaining seeds, skin, and fibers. The food mill comes with three cutting plates allowing for a variety of textures. These interchangeable cutting plates have perforations of 1.5, 2, and 4mm. This food mill's output is approximately 1 1/2 pounds per minute, and will fit onto pans smaller than 8 5/8" in diameter.